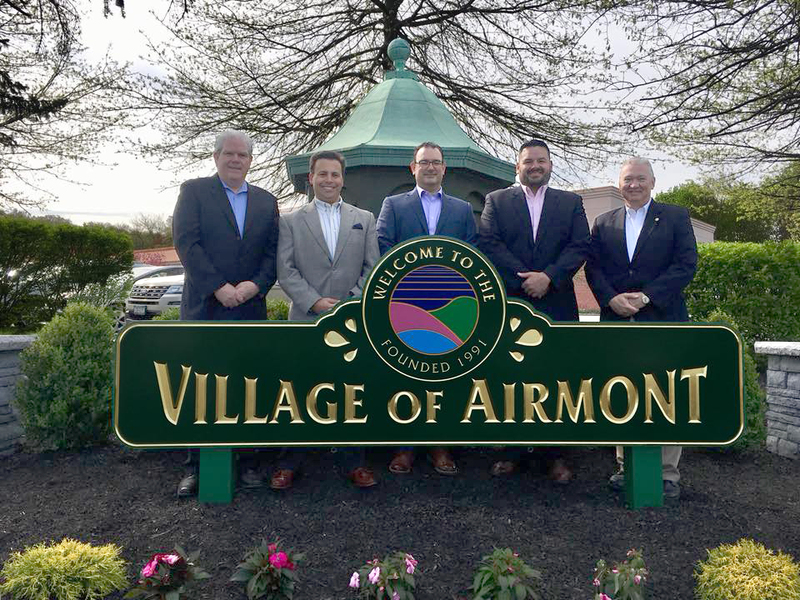 Today’s ribbon-cutting ceremony for the new “Welcome to Airmont” sign, located at the corner of South Airmont Road and Route 59, was a celebration of the present combined with an appreciation for the past. The centerpiece of the installation, which is adjacent to what is now a Walgreens store, features the antique cupola from the building that used to stand on that very spot: Airmont Elementary School. Built in 1910, the aging brick structure was torn down in the late 1980s to make way for newer construction in the sought-after Airmont business district. Mayor Philip Gigante, Deputy Mayor Paul Marchesani, and Trustees Anthony Valvo, Kevin Warbrick, and Peter Blunnie recognized both the historic significance and sentimental value of the cupola, and decided to take action. Last year, they successfully negotiated with the owner of Walgreens to make the corner plot available for an eye-catching Welcome to Airmont installation, similar to one located in nearby Suffern. After putting out a call to local landscaping companies for a design that would properly showcase the cupola, Belleville Landscaping was chosen to complete the project. Belleville generously donated their time and labor on the project, along with all of the plantings and the stone retaining wall.